Peanuts are one of my forgotten ingredients. By this I mean that they don’t ordinarily come to mind when I’m plotting out my next bake. For some reason, a vague notion that I don’t have a soft spot for this particular ingredient persists in my taste memory. It’s not that I think that I dislike them, but they just don’t excite me like, say, chocolate or dates or citrus fruit. And then I bake something with peanuts and realize, once again, that my memory is playing tricks on me. I was most recently reminded of this phenomenon when I was contacted by a representative of myprotein.com, a sports nutrition brand that stocks an exciting range of healthy flours, sweeteners, nut butters, and so forth, in addition to protein powders and energy bars. They sent me three products to review: virgin coconut oil, xylitol (a natural sugar substitute), and their all-natural peanut butter. I was tremendously excited with the coconut oil and xylitol, of course. 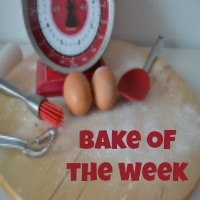 Ever since adapting my baking to cope with my mother’s egg allergy, I’ve been keen to learn about alternative ingredients and cooking for restricted diets. But peanut butter? What’s exciting about that? That was until I opened up the vat (it is far too large of a container to be termed a “jar”) and inhaled the tantalizing aroma of pure peanut butter. MyProtein’s peanut butter is made simply by grinding up whole, skin-on roasted peanuts, and the straightforward treatment shows in the intensity of the butter’s flavour. I could hardly wait to get a spoon in there and start baking. Oh, yes, I don’t like peanuts. Hmm, who does my memory think it is fooling? I really should know better. After all, Mr. Goodbar was always my favourite candy bar as a kid. I decided to make peanut butter scones, as I’ve had the idea on my baking wish list since June 14th last year. I know the exact date because I keep a stack of notebooks called my “food journals” in which I write down recipes I’ve tested, restaurant reviews, notes on food magazines, kitchen products that have caught my eye, or ideas for more recipes to test. These come under the entry heading “Recipe Inspiration,” and if I actually tried to make all the ideas I’ve come up with over the years, I’d generate enough content to keep this blog running for the next decade or so. Well, one has to start somewhere, so here we go. 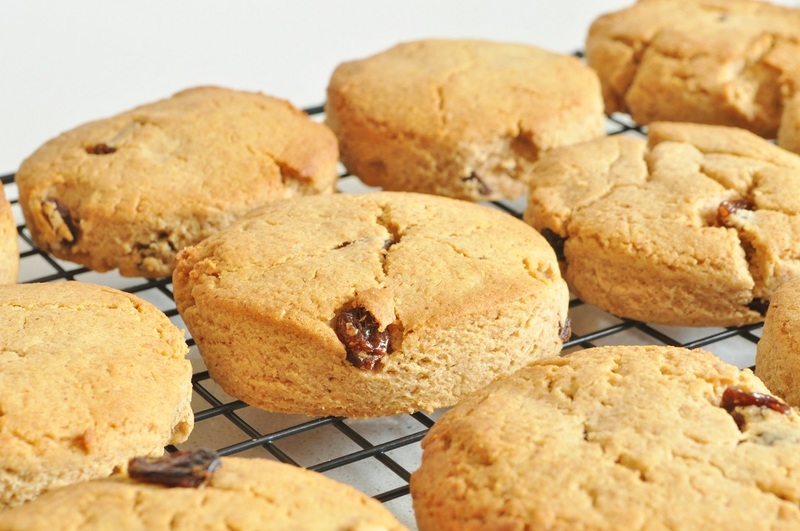 Peanut butter scones. 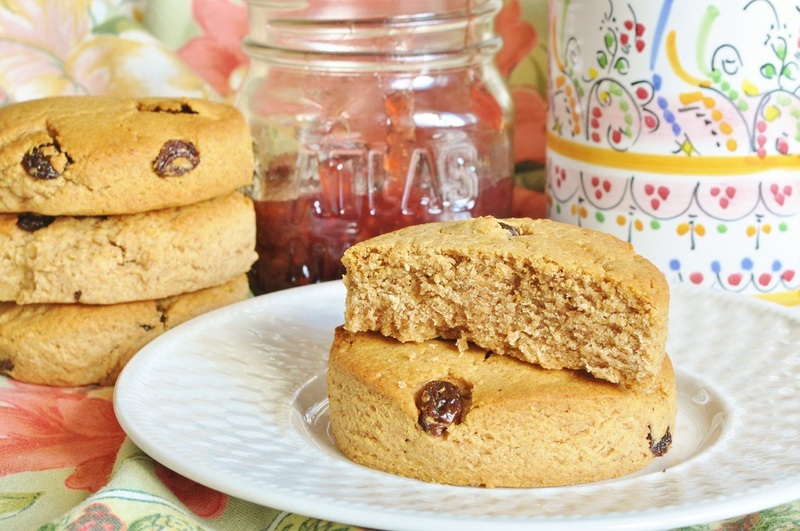 In keeping with the idea of health and fitness, as befitting a sports nutrition brand, I decided to make them with spelt flour (half wholemeal and half white), and used honey for part of the sweetening. 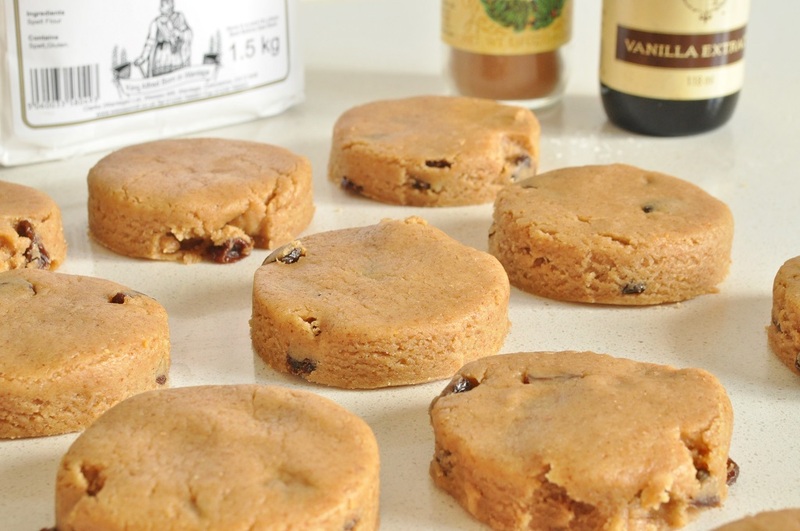 Then I added raisins because it’s not a proper scone without some kind of dried fruit, and I also put in a touch of cinnamon because I love the way it works with the combination of peanuts and honey. The rest of the family was divided on the latter addition, so I’ve made it optional and left it up to your personal discretion. 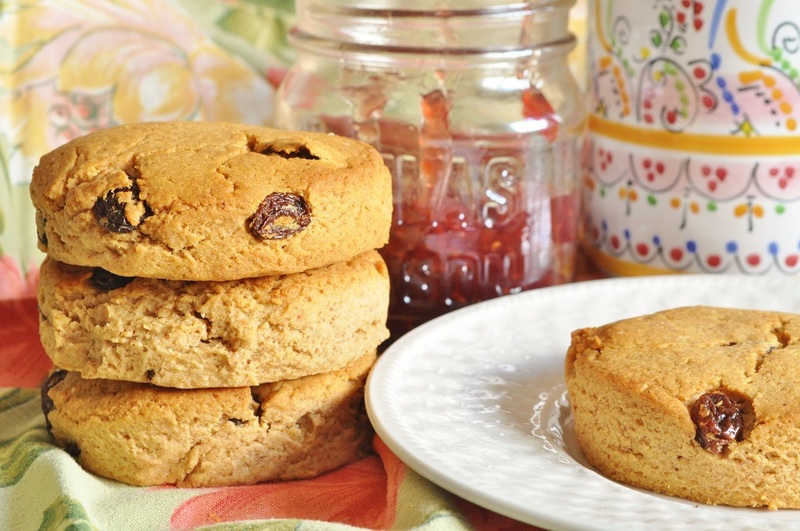 But although you don’t need to put anything on these scones—they are quite well able to stand on their own—please dig out a jar of whatever kind of jelly you ate on peanut butter-and-jelly sandwiches as a kid, and bite into a piece of childhood nostalgia. I hear grape and strawberry are the most common pairings, although I always had raspberry jelly on mine . . . I guess I’ve always been an original thinker, especially in the kitchen. I think we’ll start working through all those “Recipe Inspirations” on a regular basis now. After we finish the tub of peanut butter and do some experimentation with the coconut oil and xylitol, that is. I’ve already tested several more recipes using the MyProtein products, and I am very excited to share them with you in the upcoming weeks. I know it’s jumping the gun a little bit to say this, but xylitol is amazing. I think I’m going to start a range of diabetic chocolates for my markets, now that I’ve found a good all-natural sugar substitute. 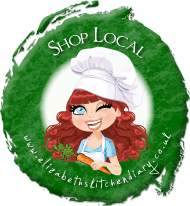 I am submitting this recipe to Elizabeth’s Kitchen Diary’s Shop Local challenge, as I used some fabulous spelt flour that I found at my local farm shop. The flour comes from a small mill in Oxfordshire, Wessex Mill. On their website, they sell a large range of flours and other grains as well, including poppy seeds for the best price I’ve ever seen. I think there’s a recipe idea somewhere in my notebook that involves poppy seeds . . .
Disclaimer: I was sent products from myprotein.com to review and use in my recipes. I was not required to write a positive review and all thoughts expressed are my own. Preheat the oven to 400°F/200°C. Lightly grease a baking sheet. Sift the flours, baking powder, brown sugar, salt, and cinnamon (if using) into a large bowl. Whisk together thoroughly and then add the cubed butter. Using your fingertips, rub the butter into the dry ingredients until cornflake-sized pieces remain. Toss in the raisins. In a small bowl or pitcher, whisk together the milk, honey, vanilla, and peanut butter. Pour into the dry ingredients and stir until the dough comes together into a ball. Turn out onto a floured surface and briefly knead the dough until it is smooth, about 20 times in all. Roll the dough out to a generous ½-inch thickness and cut into rounds with a 2 ½-inch cutter. Gather the scraps, re-roll, and cut into rounds as well. Place the rounds on the prepared baking sheet and transfer to the oven. 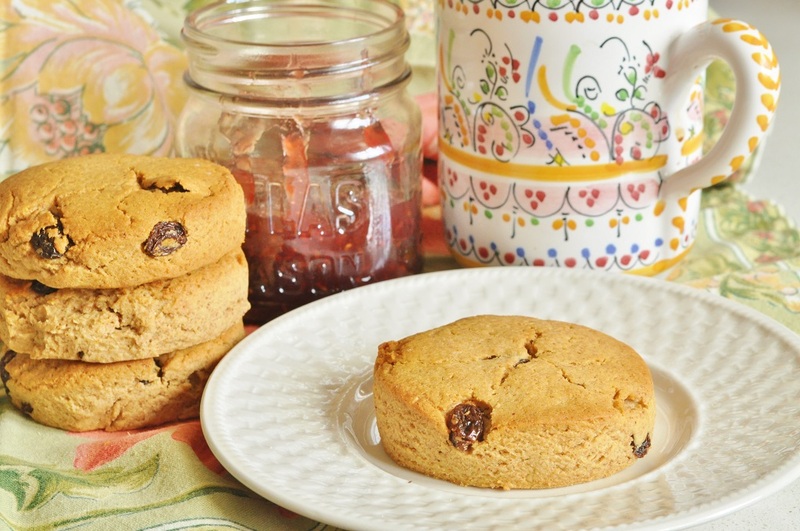 Bake until the scones are set and browned around the edges, about 15 minutes. Remove the scones to a wire rack to cool. Serve warm or at room temperature, with butter and the jelly that you favour most on peanut butter-and-jelly sandwiches! 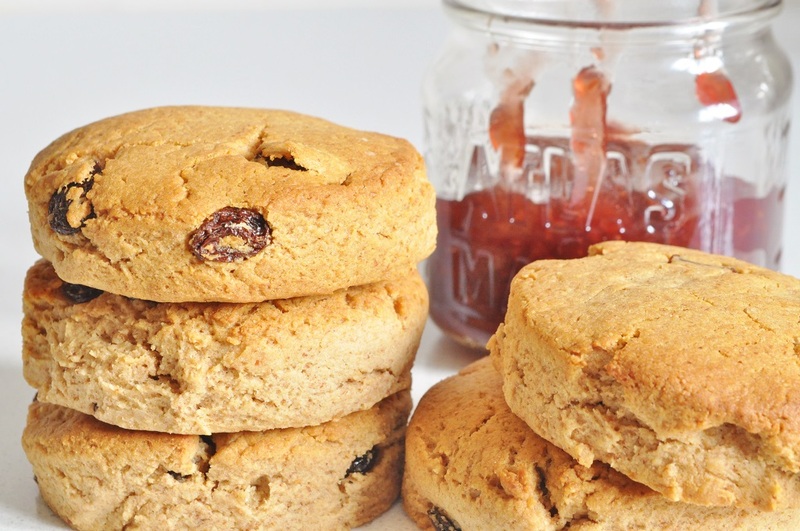 The scones are best served on the day they are made, but may also be stored in the freezer for up to 1 month. I’ve never had a peanut butter scone which upsets me greatly. I NEED these! Writing up the post has made me need a second batch! I have another peanut butter recipe coming to the blog soon, and I also recently made some salted peanut–white chocolate biscuits which were the most heavenly thing I’d baked in months! Thanks you for the lovely comments about my blog Alexandra! I live in Oxford and I agree Wessex Mill flour is very good, i’ve used it in lots of bread-making and Viennoiserie! What a delightful coincidence! I use their white spelt bread flour regularly now (and I really must get some of those poppy seeds). I was glad to be able to say a word in praise of your blog; it’s absolutely lovely. 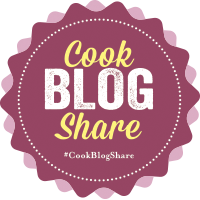 And thank you very much for hosting #CookBlogShare.